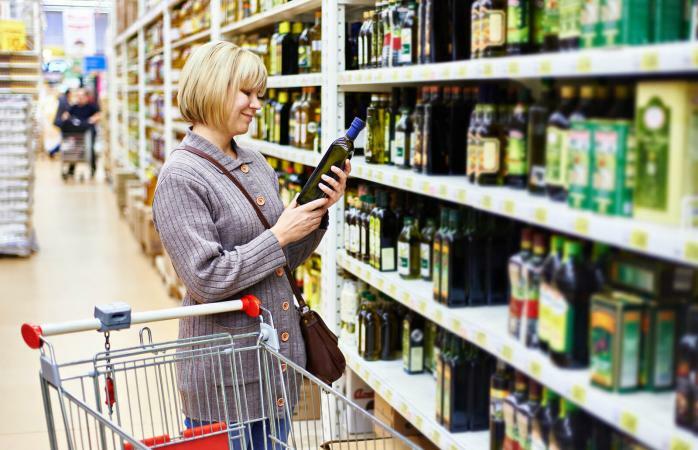 In many grocery stores, cooking oils take up a large part of the baking aisle. Almost all oils are represented, but canola and olive oil options dominate. You may have heard both are good for you and versatile in cooking. If that's true, is one a better choice than the other? Canola is a variety of the rapeseed plant, a pretty plant with vivid yellow flowers. It's part of the Brassicaceae family, the same family that cabbage, broccoli, Brussels sprouts, and cauliflower come from. Some people refer to canola oil as rapeseed oil. Canola plants produce pods filled with tiny seeds. According to the U.S. Canola Association, each canola seed contains 44 percent oil. After the seeds are harvested, they are crushed and refined. Most canola oils undergo an extraction process using hexane. Hexane is a chemical solvent and cleaning agent. After the oil is extracted, it is deodorized to remove its strong scent. The end result is canola oil, a pale-yellow oil with a light taste and high smoke point. Using canola oil is controversial. Some people, especially natural health and clean eating advocates, claim it's toxic since much of it is genetically modified and highly processed, contains erucic acid (a compound toxic to humans in large amounts), and is partially hydrogenated. It's also unclear how much hexane is left behind during extraction and how it impacts any health benefits. Others, like the Mayo Clinic, believe canola is safe and healthy since it contains very low levels of erucic acid, is low in saturated fat, and high in healthy fats. According to Berkley Wellness, canola oil contains a mix of saturated, polyunsaturated, and monounsaturated fats (omega-9 fatty acids). It is lowest in saturated fat and highest in monounsaturated fat. In fact, canola oil has almost as much monounsaturated fat as olive oil. Research shows replacing dairy fats with canola oil may lower "bad" cholesterol (LDL) and triglycerides in people with high cholesterol. It may also reduce blood clotting and LDL oxidation. Since canola oil is stable and has one of the highest smoke points of all cooking oils (464-470 degrees Fahrenheit), it may be used in almost any recipe that calls for vegetable oil. It's good for baking, sauteing, stir-frying, and deep-frying. Canola oil has little taste and blends well with most foods and seasonings. It helps bring out the natural flavors of foods instead of overpowering them. Throughout history, people have used olive oil for its culinary, health, and beauty benefits. Olive oil comes from the fruit of olive trees. It's made by pressing or crushing olives to extract their oil. "Extra virgin" and "virgin" olive oils are not refined with chemicals or heat. According to Olive Oil Times, extra virgin olive oil has the highest nutrient value. According to Medical News Today, olive oil may help prevent depression. People who consume olive oil instead of trans fats are less likely to be depressed. Olive oil also has a higher smoke point (375-420 degrees Fahrenheit) and a strong, fruity flavor. This makes it ideal for using raw in dressings and marinades. It's also great for dipping bread or drizzling on grilled vegetables. You can cook and deep fry with olive oil. In fact, a study published in Food Chemistry showed that foods fried in extra virgin olive oil had more health benefits. Additionally, an article in ACTA Scientific Nutritional Health showed that olive oil remained more stable and yielded less byproducts than canola oil when used at higher heat. Are Canola and Olive Oil Interchangeable? Sometimes, canola and olive oil can be substituted for each other. For example, you can use both in salad dressings and marinades, or to saute. However, many recipes work better with one or the other. Canola oils neutral taste makes it a go-to for frying and baking. Olive oil comes out on top when you need an oil with strong flavor to stand on its own. It's also suitable if you are looking for a stable frying oil that can enhance the nutritional value in your food. Despite positive studies showing canola oil's health benefits, opponents suggest the research is flawed. If you're concerned about canola oil's safety, try organic canola oil, which is not genetically modified. To limit chemical exposure, look for oils which are expeller pressed or cold pressed. This means chemicals like hexane were not used to extract the oil. It also means the oil was not deodorized. Both oils have pros and cons. For health benefits, olive oil wins hands down. In the cooking versatility category, canola oil comes out on top. Overall, which oil is best depends on your personal taste, how you use it, and where you fall on the canola oil controversy spectrum.